PD01KF1062 EBC Front Brake Kit (Standard Discs & GreenStuff Pads) Nissan Primera. 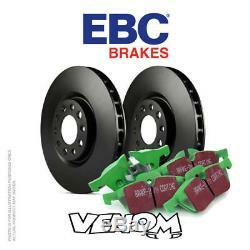 EBC Front Brake Kit (Standard Discs & GreenStuff Pads). Nissan Primera 2.0 GT (P11). Contents: Full Front Axle Brake Kit [Discs & Pads]. Fits Models with: Girling/TRW Calipers. Disc Height (Laid Flat): 49mm. Brake Discs in Kit: D Discs (D969). Pads in Kit: GreenStuff Pads (DP21238). This listing is for a full front axle EBC Brake Kit to fit models fitted with Girling/TRW brake calipers. IMPORTANT The disc specifics above must exactly match the discs currently fitted to your vehicle. Please also check the pad shape image to ensure that the pads exactly match your current pad shape. There may be more than one disc size and pad shape available for your vehicle! We sell over 250,000 performance car parts online! Sadly, it is impossible for us to stock all of these parts all of the time and ultimately this would only lead to increased prices. Sometimes a part may have to be manufactured or even imported from another country for you. Where we are informed of a delay we will do our best to keep you updated. We cannot guarantee product availability. Please do not schedule any work on your vehicle until you have received and fully inspected your parts. The item "EBC Front Brake Kit Discs & Pads for Nissan Primera 2.0 GT (P11) 97-99" is in sale since Saturday, March 10, 2018. This item is in the category "Vehicle Parts & Accessories\Car Tuning & Styling\Performance Braking\Performance Brake Discs". The seller is "venommotorsport" and is located in Preston. This item can be shipped to United Kingdom, Austria, Belgium, Bulgaria, Croatia, Cyprus, Czech republic, Denmark, Estonia, Finland, France, Germany, Greece, Hungary, Ireland, Italy, Latvia, Lithuania, Luxembourg, Malta, Netherlands, Poland, Portugal, Romania, Slovakia, Slovenia, Sweden, Australia, United States, Canada, Brazil, Japan, New Zealand, Hong Kong, Norway, Indonesia, Malaysia, Mexico, Singapore, South Korea, Switzerland, Taiwan, Thailand, Saudi arabia, South africa, United arab emirates, Ukraine, Chile, Spain, Antigua and barbuda, China, Bangladesh, Belize, Bermuda, Bolivia, Barbados, Brunei darussalam, Cayman islands, Dominica, Ecuador, Egypt, Guernsey, Gibraltar, Guadeloupe, Grenada, French guiana, Iceland, Jersey, Jordan, Cambodia, Saint kitts and nevis, Saint lucia, Liechtenstein, Sri lanka, Macao, Monaco, Maldives, Montserrat, Martinique, Nicaragua, Oman, Pakistan, Peru, Paraguay, Reunion, Turks and caicos islands, Aruba.